Heat oven to 350°F. Bake biscuits as directed on can. Meanwhile, crumble sausage into large skillet. Cook over medium-high heat until browned and no longer pink, stirring frequently. With wire whisk, stir in flour, salt and pepper. Gradually stir in milk. Cook until mixture thickens, stirring constantly. Split warm biscuits; place on serving plates. Serve sausage mixture over warm split biscuits. A sausage pan gravy (often made in a well-seasoned cast-iron skillet) is one of the simplest of country-style recipes—a whisk or a wooden spoon works well to blend the flour into the cooked sausage, creating a type of roux with the fat in the pan. Pour the milk in gradually while you keep stirring, so the gravy is free of flour lumps and thickens well. Freshly ground pepper adds a spicy edge with a little sweetness, while finely chopped fresh sage leaves would give an earthy herbal flavor and aroma that complements pork or chicken. Sub in other types of bulk sausage—from spicy Italian (use beef broth instead of milk) to mild chicken (use milk and a dash of poultry seasoning). They all make meaty gravies that are just the right consistency to spoon over hot, flaky biscuits. This recipe can be made using Pillsbury® Grands!® Jr. biscuits as well! Bake biscuits as directed on can, then prepare recipe according to directions above. Flaky biscuits. Creamy peppered gravy. Zesty pork sausage. What’s not to love about classic biscuits and gravy? It requires minimal ingredients and is versatile enough to be made for either breakfast or dinner. While we love ordering a good ol’ biscuits and gravy breakfast from our local diner, making it at home is a snap, especially when you’re working with pre-made biscuit dough. The concept of pouring creamy gravy over biscuits is nothing new. When European settlers arrived in the United States, they brought a simple method of cooking with them that often relied on a base of meat, bread and gravy. 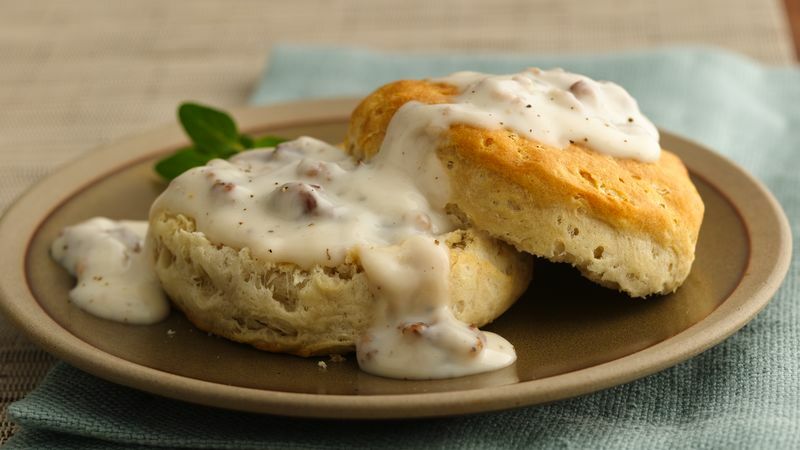 Biscuits and sausage gravy became a distinguished dish after the American Revolutionary War during which there was a shortage of food and money. Since the recipe required very basic and budget-friendly ingredients, it became a regular breakfast dish in the South. Breakfast was especially important and had to be hearty for those who worked on the plantations all day. Nowadays, biscuits and gravy shows up on breakfast menus all over the United States and several variations have been introduced since the original recipe. The already-simple recipe can be further simplified by using your slow cooker to make them or you can even use your 13x9 to make a casserole version of biscuits and gravy.